Author(s): A. Morales-Toledo, C. Afonso-Olivares, S. Montesdeoca-Esponda, R. Guedes-Alonso, Z. Sosa-Ferrera, J. J. Santana-Rodríguez. Departamento de Química, Universidad de Las Palmas de Gran Canaria, 35017, Las Palmas de Gran Canaria, Spain. Background: Tons of pharmaceutical compounds are used every year around the world in human and veterinary medicine, and these can reach wastewater treatment plants by metabolic excretion and/or improper disposal. Some compounds are not completely eliminated during the wastewater purification processes and are introduced into the environment through a variety of sources and pathways. 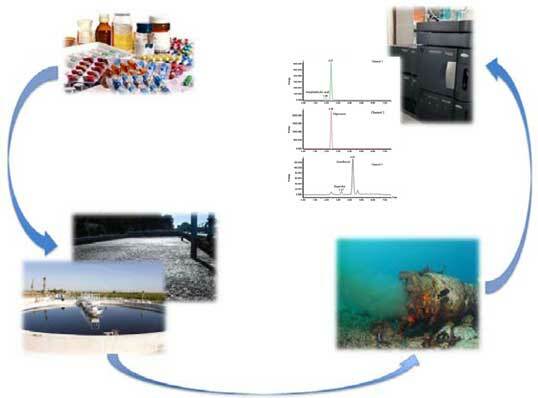 Pharmaceuticals can have large toxicological effects on the marine biota. It is necessary to develop sensitive and selective analytical methodologies in order to determine these compounds at the low requiered levels. Methods: Development of procedures for the determination of four pharmaceuticals (acetylsalicylic acid, naproxen, ibuprofen and gemfibrozil) in both water and sludge samples, based on solid phase extraction (SPE) and microwave assisted extraction (MAE) followed by ultra-high performance liquid chromatography with fluorescence detection (UHPLC-FD). Results: The optimum conditions for the SPE procedure were extraction with an Oasis HLB cartridge, 250 mL of sample at pH 9 without salt addition, 5 mL of Milli-Q water for the wash step and 3 mL of methanol for the elution. For the MAE procedure, the following conditions were used: power of 500 W, an extraction time of 6 min and 5 mL of methanol as the extractant. Limits of detection between 13.20 and 1338 ng·L-1 for liquid samples and between 1.16 and 86.4 ng·g-1 for solid samples were obtained. Recoveries were over 79% and 69% for liquid and solid samples, respectively. The application of the optimized methodology to sewage samples from different elimination treatments allows for the detection of gemfibrozil at a concentration of 2.52 µg·L-1. Sludge samples were also analyzed, but any compound was detected. Keywords: Pharmaceutical compounds, sewage, sludge, ultra-high performance liquid chromatography, fluorescence detection, solid phase extraction, microwave assisted extraction. Affiliation:Departamento de Química, Universidad de Las Palmas de Gran Canaria, 35017, Las Palmas de Gran Canaria, Spain. Keywords:Pharmaceutical compounds, sewage, sludge, ultra-high performance liquid chromatography, fluorescence detection, solid phase extraction, microwave assisted extraction. Abstract:Background: Tons of pharmaceutical compounds are used every year around the world in human and veterinary medicine, and these can reach wastewater treatment plants by metabolic excretion and/or improper disposal. Some compounds are not completely eliminated during the wastewater purification processes and are introduced into the environment through a variety of sources and pathways. Pharmaceuticals can have large toxicological effects on the marine biota. It is necessary to develop sensitive and selective analytical methodologies in order to determine these compounds at the low requiered levels.